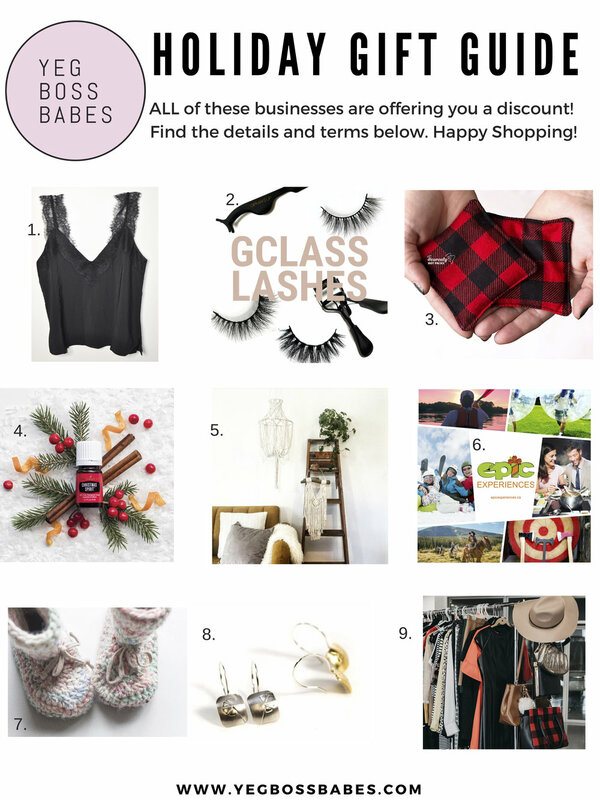 Our 2018 Holiday Gift Guide is curated by the YEG BOSS BABES Team and highlights local businesses owned by women in Alberta! We are proud to have partnered with these amazing experts, makers and creatives who are offering YOU discounts just in time for Holiday shopping! How to redeem discount: On website at checkout, enter the promo code discount and then click “Apply”. *VALID UNTIL DEC 25, 2018. How to redeem discount: On website, use coupon code: YBB15 at checkout. *VALID UNTIL DEC 24, 2018. How to redeem discount: On website, enter promo code at checkout. *VALID UNTIL JAN 31, 2019. How to redeem discount: Contract Liz Agudelo via email hello@lizagudelo.com and mention YBB HOLIDAY GIFT GUIDE. *VALID UNTIL JAN 15, 2019. How to redeem discount: In order to obtain a custom piece with this discount customers must contact Jessica by emailing nestingbynightingale@gmail.com and mention YBB HOLIDAY GIFT GUIDE. *VALID UNTIL JAN 31, 2019. How to redeem discount: Select an experience package and proceed to checkout. Redeem a promo by clicking on “Apply Coupon”. *VALID UNTIL JAN 1, 2019. How to redeem discount: Enter code YEGBOSS at checkout. *VALID UNTIL DEC 31, 2018. How to redeem discount: On website, enter YBB15 at checkout. OR, in person, mention the YBB Gift Guide! *VALID UNTIL DEC 31, 2018. YBB Discount: 30% OFF any styling package when purchased between Dec 1 - 15, 2018. 20% OFF a wardrobe consultation when purchased between Dec 1 - 15, 2018. How to redeem discount: By contacting Jen via website contact page referencing discount code BOSSBABESSTYLE20 or BOSSBABESSTYLE30. How to redeem discount: Enter code BOSSBABES upon checkout on website. *VALID UNTIL JAN 31, 2019. YBB Discount: Receive $10 off your first $50+ KEEP Collective Order. How to redeem discount: Email Andrea.nwobosi@gmail.com to request your personal shopping link. YBB Discount: $5 OFF your order. * Applicable to any size print or custom order when placed directly through website. How to redeem discount: Complete the order form on website and mention YEGBOSSBABES. *VALID UNTIL JAN 31, 2019. How to redeem discount: Send email to bravefoxcoffee@shaw.ca and inform us you are apart of the YBB Community and request the 15% OFF discount from your order. *VALID UNTIL JAN 6, 2019. How to redeem discount: On website, use code BOSSBABE at checkout. *VALID UNTIL DEC 31, 2018. How to redeem discount: Contact by email (munchme@caramunchies.com) for order sheet and mention that you are part of the YBB Community. *VALID UNTIL DEC 20, 2018. How to redeem discount: Use code YEGBOSSBABE when contacting Krystal for booking or to make a purchase on website or little.bird.holistices@gmail.com. *VALID UNTIL JAN 31, 2019. Contact directly to activate code online. $5 OFF ‘Be You’ Sweatshirts. How to redeem discount: Contact Emma by email (emmawood@prettyasapicture.ca) referencing discount code YBB2019BEYOU. VALID UNTIL DEC 21, 2018. How to redeem discount: Use discount code YEGBOSSBABES on website. *VALID UNTIL DEC 24, 2018 11:30PM.